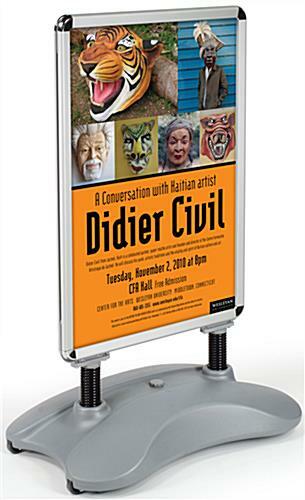 This sandwich board, also called a curb sign, is a great way to draw attention from the street. 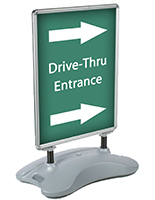 This form of pavement sign lures customers into your store! 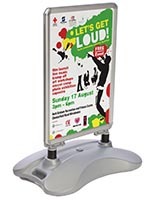 Designed especially for outdoor use, this sandwich board is made from durable materials for a stable and long-lasting construction. 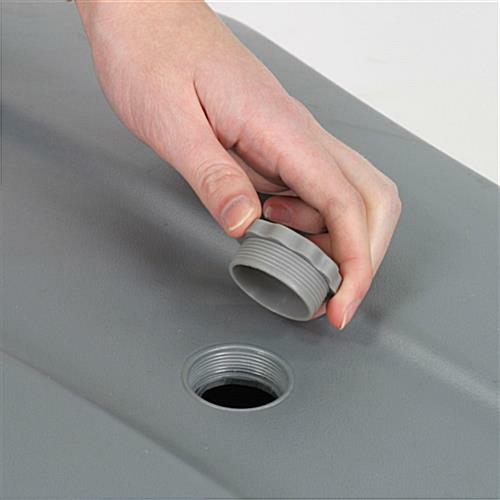 The heavy-duty, molded plastic base features a screw-in cap and can be filled with water or sand for weight and support. 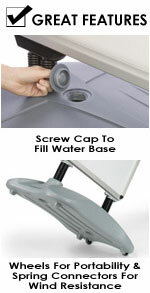 Holding almost 7 gallons of water, this sandwich board base weighs over 65lbs when filled! 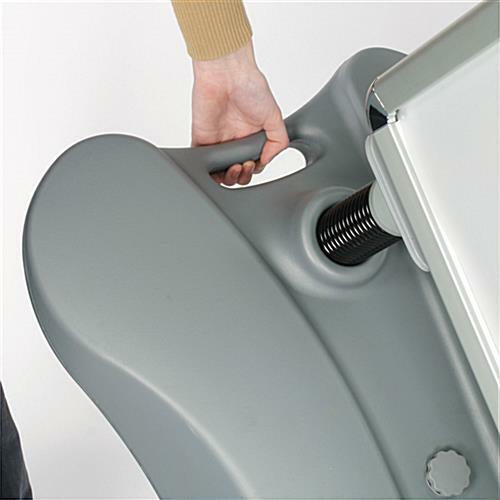 This will keep your curb sign steady, and lessen the chances of it blowing over in the wind. 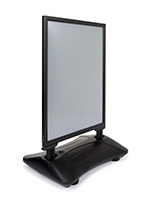 Built-in wheels also make your sandwich board easy to move from location to location as needed. 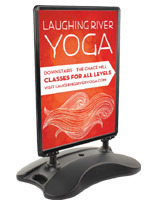 To further enhance the stability of your display, this sidewalk sign features rugged springs to reduce the impact of wind. 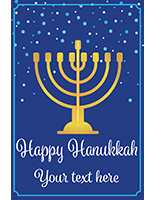 A sandwich board is perfect for setting outside your office, restaurant, or retail store. Advertisers at these establishments can let passersby know about sales and upcoming events. 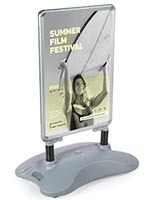 Featuring a double-sided, snap-open poster frame, this sandwich board will attract attention from all angles. 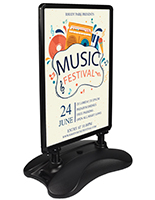 To load your sign frame with an eye-catching message, just snap open the four edges, place your poster inside and snap shut! 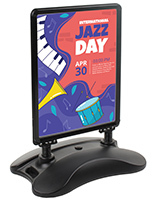 To keep your posters and advertisements looking fresh and new, the sandwich board also features a non-glare protective lens. 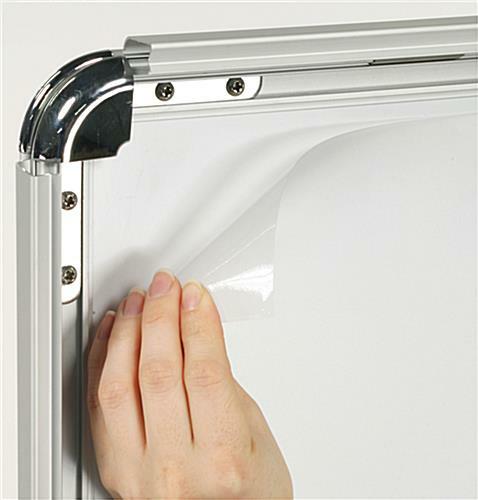 Please note that while the snap frames and lens work to seal out moisture, your posters may become damaged if used in very harsh conditions such as heavy rain and snowstorms. Please Note: This sandwich board is not weatherproof; some water can seep into the frame and possibly damage your posters. We recommend either printing your signs onto a thin plastic material or bringing the sandwich board indoors during wet weather conditions. 25.3" x 46.5" x 17.5"
32.0" x 5.5" x 20.0"
The sign had some dents on the metal back, but they shouldn't be visible when we insert the poster. Otherwise, I am happy with the product. Well that won't do! A customer care specialist will be reaching out soon to assist you in finding a solution that works best for you. We owned this same sign for a long time, but never filled it with water. We work in a very windy place, and the wind ended up destroying it. The sign is very sturdy, and this time, I immediately filled it with water, and can tell it's not going anywhere! Looking forward to having this one for years. Thanks for the great review, AJ! We hope you shop with us again soon. Sign stand looks great and is very durable. Its also super simple to put together. Highly recommend for anyone looking to increase foot traffic to their business.